Happy Kitchen Sink Stamps Monday, thanks for stopping by today, I hope you had a great weekend! Our tomatoes are finally coming in by the bushel full, now that I have plenty, I'm looking forward to making homemade Salsa! Inspired by the garden harvest, I used the Multi Step Tomato and Multi Step Berries to create a CAS card that would be perfect to give with a gift of tomatoes! I love this pretty red juicy tomato. It looks great with your dp choices. Doin' the salsa huh....this tomato looks good enuf to pick right off the page, luv the papers! Your tomatoes are spot on! Love the card! 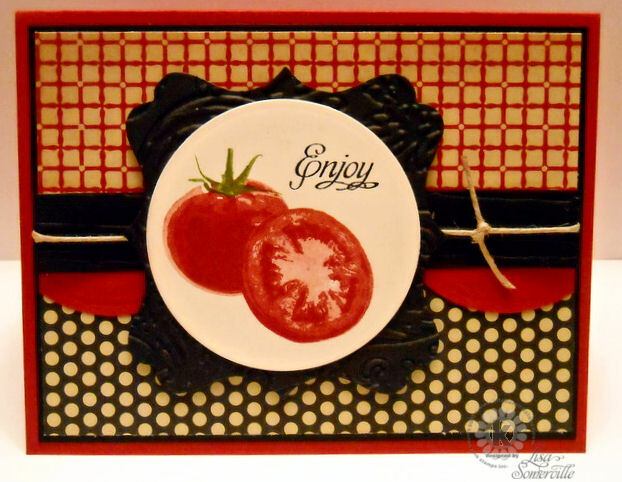 Love all these fabulous layers and gorgeous papers with your wonderful tomatoes!! Your card is sensational, Lisa! So perfect for your salsa! The KSS images are SO realistic! I smiled when I saw your card because this morning I was photographing a little red tomato for a photo blog challenge. I used the 'selective color' feature on one of my cameras, so only the tomato is red and everything else is gray. I did consider cutting the tomato in half, but the plants are my husband's and I don't really eat tomatoes that often. Cute, cute card, Lisa! Beautiful card, but now I am craving tomatoes! Pass the salt shaker! There's nothing better than homegrown tomatoes, except maybe your artwork! Delicious and lovely! Great sketch... The papers work wonderfully with the design. Beautiful card Lisa!! I love your fantastic design and choice of colors!